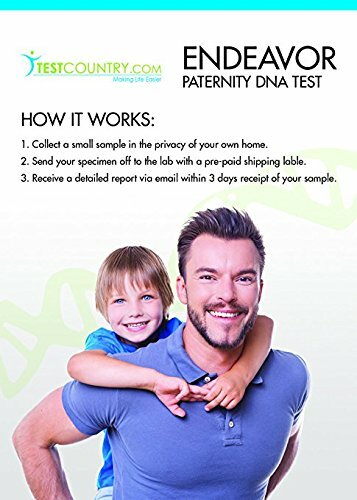 The At-Home Non-Legal DNA Paternity Buccal Test Kit (2-Person) compares a child's DNA pattern with that of an alleged father to determine whether a biological relationship exists. In a standard DNA paternity test, the tested parties include a child, the alleged father, and the mother. The mother's participation in a paternity tests helps to exclude half of the child's DNA, leaving the other half for comparison with the alleged father's DNA. Although including the mother is always recommended, we can perform a paternity test without the mother's participation. The analysis is performed using 23 genetic markers allowing for greater accuracy and reliability. Our Home DNA Paternity Tests use the most advanced technology as well as the highest quality materials, making this test one of the top of the line tests on the market. This test kit provides fast results in approximately 24 to 48 hours and is accurate and reliable. This home paternity test is a saliva based DNA screening, which is one of the most commonly used methods of paternity testing. The procedure is non-invasive, only requiring a simple cheek swab Upon analysis of multiple genetic markers in the DNA samples, paternity is confirmed. Most often, paternity tests are carried out to resolve issues where a biological father refuses to adopt the child or where a woman has had several sexual partners around the time she conceives. We believe that your privacy and client confidentiality is of paramount importance. We go to great lengths to ensure our Laboratory Management System has the most up-to-date technology available to ensure data integrity, data encryption, redundancy, and archival of information. All of our DNA paternity tests utilize stringent, validated testing procedures in order to achieve 100% accurate results. Due to state law, this product cannot be shipped to the state of New York. If you have any questions about this product by Endeavor DNA, contact us by completing and submitting the form below. If you are looking for a specif part number, please include it with your message. By Mark E Wilkins, Ph.D.